The Sunetra Eye Centre is proud to announce the introduction of the Pentacam HR to our array of state-of-the-art testing equipment. This new device allows Dr. Aniel Malhotra an unparalleled amount of testing while delivering more accurate results. The Pentacam HR (high resolution) uses an advanced 3D camera that rotates around the eye while snapping a rapid series of pictures. The advanced software is then able to reconstruct a 3D model of the cornea, while delivering important information required to accurately plan LASIK treatment. 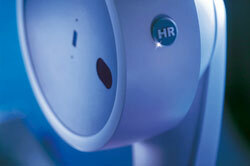 The Pentacam HR is the new standard for pre-test care at the Laser Eye Institute. The Pentacam now plays an important role in planning the CustomVue customized LASIK treatment. The Pentacam is actually performing five tests as once and generating hundreds of calculations instantly, vastly reducing the amount of testing required! Purchasing the Pentacam was an easy decision. The device solidifies Dr. Aniel Malhotra;s commitment to providing the absolute best level of care! "We are committed to providing patients with the safest and most advanced technology available" Dr. Aniel Malhotra continues "the Pentacam HR is simply the most advanced LASIK pre-testing device available!" At the Sunetra Eye Centre you are guaranteed to receive the safest technology with the highest level of personalized care in the world!